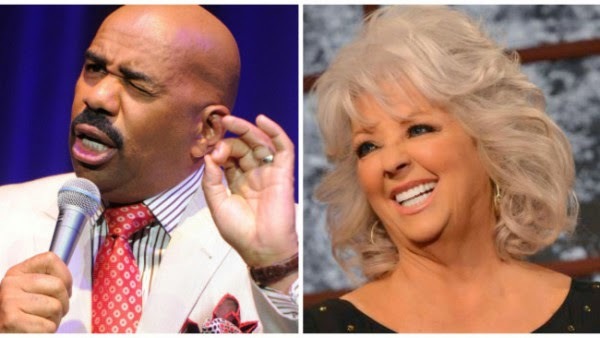 Paula Deen may still occupy a space on the bad side of some, but Steve Harvey isn’t one of those people. The syndicated radio and TV host, who is set to interview Deen today on his self-titled daytime talk show, is bringing the former Food Network personality in for his annual Steve Harvey Mentoring Camp. Deen will spend time at the four-day event helping young men who have an interest in the culinary arts. “Paula and her team agreed to take as many boys as I want to fly down to Savannah [Georgia]…and teach them culinary skills. That, to me, is how you get something from something,” Harvey said in a clip from his show. Held in Dallas during Father’s Day weekend, the Steve Harvey Mentoring Camp was founded by Harvey to teach fatherless young men about “personal responsibility, dream building and the importance of nutrition and physical fitness,” according to the organization’s official website. In addition to announcing Deen’s participation in the mentoring camp, Harvey touched on the controversy surrounding 67-year-old chef in 2013. Deen’s interview with the talk show host comes months after Food Network declined to renew her contract after she admitted using the “N-word” in the past.